Goldfish is the common name for a freshwater fish, Carassius auratus, of the carp or minnow family, Cyprinidae, that is native to East Asia and has been domesticated and developed into many ornamental breeds for aquariums and water gardens. One of the earliest fish to be domesticated—in China over 1,000 years ago (BAS 2007)—the goldfish remains one of the most popular aquarium fish. Over the centuries, through human creativity acting on the foundation of an original carp species, many color variations have been produced, some far different form the original "golden" color of the first domesticated fish. Diverse forms have also been developed. 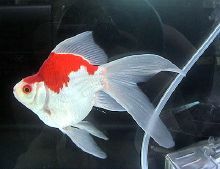 Beyond the aesthetic pleasure from such varieties, goldfish have also offered practical value in control of mosquitoes. A relatively small member of the Cyprinidae family, the goldfish is a domesticated version of a dark-gray/brown carp native to East Asia. The Cyprinidae family is the largest family of freshwater fishes in the world, and may be the largest family of vertebrates (with the possible exception of Gobiidae) (Nelson 1994). Common names associated with various members of this family include minnow, carp, chub, and shiner. Nelson (1994) recognizes 210 genera and over 2,000 species in Cyprinidae, with about 1,270 species native in Eurasia, about 475 species in 23 genera in Africa, and about 270 species in 50 genera in North America. Particularly well-known species include the common carp and koi (Cyprinus carpio), goldfish (Carassius auratus), and zebra danio or zebrafish (Brachydanio rerio), the latter used extensively in genetic research (Nelson 1994). Members of the Cyprinidae are characterized by pharyngeal teeth in one or two rows, with no more than eight teeth per row; usually thin lips, an upper jaw usually protrusible; and an upper jaw bordered only by premaxilla (Nelson 1994). Goldfish, Carassius auratus, may grow to a maximum length of 23 inches (59 cm) and a maximum weight of 9.9 pounds (4.5 kg), although this is rare; few goldfish reach even half this size. The longest goldfish was measured at 47.4 cm (18.7 in) from snout to tail-fin end on March 24, 2003 in Hapert, The Netherlands (Guinness 2003). In optimal conditions, goldfish may live more than 20 years, but most household goldfish generally live only six to eight years, due to being kept in bowls. If left in the dark for a period of time, a goldfish will turn lighter in color. Goldfish have pigment production in response to light. Cells called chromatophores produce pigments that reflect light, and gives coloration. The color of a goldfish is determined by which pigments are in the cells, how many pigments molecules there are, and whether the pigment is grouped inside the cell or is spaced throughout the cytoplasm. So if a goldfish is kept in the dark it will appear lighter in the morning, and over a long period of time will lose its color. A group of goldfish is known as a troubling (Owens 2009). Goldfish, like all cyprinids, lay eggs. They produce adhesive eggs that attach to aquatic vegetation. The eggs hatch within 48 to 72 hours, releasing fry large enough to be described as appearing like "an eyelash with two eyeballs." Within a week or so, the fry begin to look more like a goldfish in shape, although it can take as much as a year before they develop a mature goldfish color; until then they are a metallic brown like their wild ancestors. In their first weeks of existence, the fry grow remarkably fast—an adaptation born of the high risk of getting devoured by the adult goldfish (or other fish and insects) in their environment. Some scientists believe goldfish can only grow to sexual maturity if given enough water and the right nutrition. If kept well, they may breed indoors. Breeding usually happens after a significant change in temperature, often in spring. In aquariums, eggs should then be separated into another tank, as the parents will likely eat any of their young that they happen upon. Dense plants such as Cabomba or Elodea or a spawning mop are used to catch the eggs. Most goldfish can and will breed if left to themselves, particularly in pond settings. Males chase the females around, bumping and nudging them in order to prompt the females to release her eggs, which the males then fertilize. Due to the strange shapes of some extreme modern bred goldfish, certain types can no longer breed among themselves. In these cases, a method of artificial breeding is used called hand stripping. This method keeps the breed going, but can be dangerous and harmful to the fish if not done correctly. Like some other popular aquarium fish, such as the guppies, goldfish and other carp are frequently added to stagnant bodies of water in order to reduce the mosquito populations in some parts of the world, especially to prevent the spread of West Nile Virus, which relies on mosquitoes to migrate (Alameda 2011). However, the introduction of goldfish has often had negative consequences for local ecosystems (Winter 2005). 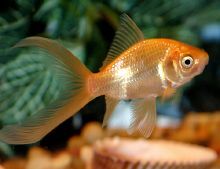 Behavior can vary widely both because goldfish are housed in a variety of environments, and because their behavior can be conditioned by their owners. A common belief that goldfish have a three-second memory has been proven false (Henderson 2003). Research has demonstrated that goldfish have a memory-span of at least three months and can distinguish between different shapes, colors and sounds (Henderson 2003). They were trained to push a lever to earn a food reward; when the lever was fixed to work only for an hour a day, the fish soon learned to activate it at the correct time (Henderson 2003; Lloyd and Mitchinson 2006). Scientific studies done on the matter have shown that goldfish have strong associative learning abilities, as well as social learning skills. In addition, their strong visual acuity allows them to distinguish between different humans. It is quite possible that owners will notice the fish react favorably to them (swimming to the front of the glass, swimming rapidly around the tank, and going to the surface mouthing for food) while hiding when other people approach the tank. Over time, goldfish should learn to associate their owners and other humans with food, often “begging” for food whenever their owners approach. Auditory responses from a blind goldfish proved that it recognized one particular family member and a friend by voice, or vibration of sound. This behavior was very remarkable because it showed that the fish recognized the vocal vibration or sound of two people specifically out of seven in the house. Goldfish also display a range of social behaviors. When new fish are introduced to the tank, aggressive social behaviors may sometimes be seen, such as chasing the new fish, or fin nipping. These usually stop within a few days. Fish that have been living together are often seen displaying schooling behavior, as well as displaying the same types of feeding behaviors. Goldfish may display similar behaviors when responding to their reflections in a mirror. Goldfish that have constant visual contact with humans also seem to stop associating them as a threat. After being kept in a tank for several weeks, it becomes possible to feed a goldfish by hand without it reacting in a frightened manner. Some goldfish have been trained to perform various tricks. Goldfish have behaviors, both as groups and as individuals, that stem from native carp behavior. They are a generalist species with varied feeding, breeding, and predators avoidance behaviors that contribute to their success in the environment. As fish they can be described as “friendly” towards each other, very rarely will a goldfish harm another goldfish, nor do the males harm the females during breeding. The only real threat that goldfish present to each other is in food competition. Commons, comets, and other faster varieties can easily eat all the food during a feeding before fancy varieties can reach it. This can be a problem that leads to stunted growth or possible starvation of fancier varieties when they are kept in a pond with their single-tailed brethren. As a result, when mixing breeds in an aquarium environment, care should be taken to combine only breeds with similar body type and swim characteristics. Goldfish natively live in ponds, and other still or slow moving bodies of water in depths up to 20 meters (65 feet). Their native climate is subtropical to tropical and they live in freshwater with a pH of 6.0–8.0, a water hardness of 5.0–19.0 dGH, and a temperature range of 40 to 106 °F (4 to 41 °C), although they will not survive long at the higher temperatures. They are considered ill-suited even to live in a heated tropical fish tank, as they are used to the greater amount of oxygen in unheated tanks, and some believe that the heat burns them. However, goldfish have been observed living for centuries in outdoor ponds in which the temperature often spikes above 86 °F (30 °C). When found in nature, goldfish are actually an olive green, greenish brown, or grayish color. In the wild, the diet consists of crustaceans, insects, and various plants. They can be quite beneficial through consuming pest species, such as mosquitoes. Fancy goldfish released into the wild are unlikely to survive for long as they are handicapped by their bright fin colors; however, it is not beyond the bounds of possibility that such a fish, especially the more hardy varieties such as the Shubunkin, could survive long enough to breed with its wild cousins. Common and comet goldfish can survive, and even thrive, in any climate in which a pond for them can be created. Introduction of wild goldfish can cause problems for native species. Within three breeding generations, the vast majority of the goldfish spawn will have reverted to their natural olive color. Since they are carp, goldfish are also capable of breeding with certain other species of carp and creating hybrid species. Goldfish are popular pond fish, since they are small, inexpensive, colorful, and very hardy. In a pond, they may even survive if brief periods of ice form on the surface, as long as there is enough oxygen remaining in the water and the pond does not freeze solid. Common goldfish, London and Bristol shubunkins, jikin, wakin, comet, and sometimes fantail can be kept in a pond all year round in temperate and subtropical climates. Moor, veiltail, oranda, and lionhead are only safe in the summer. Small to large ponds are fine for keeping goldfish, although the depth should be at least 80 centimeters (30 inches) to avoid freezing. During winter, goldfish will become sluggish, stop eating, and often stay on the bottom. They will become active again in the spring. A filter is important to clear waste and keep the pond clean. Plants are essential as they act as part of the filtration system, as well as a food source for the fish. Compatible fish include rudd, tench, orfe, and koi, but the latter will require specialized care. Ramshorn snails are helpful by eating any algae that grows in the pond. It is of great importance to introduce fish that will consume excess goldfish eggs in the pond, such as orfe. Without some form of population control, goldfish ponds can easily become overstocked. Koi may also interbreed to produce a sterile new fish. Goldfish are usually classified as a coldwater fish and can live in unheated aquariums. Like most carp, goldfish produce a large amount of waste both in their feces and through their gills, releasing harmful chemicals into the water. Build-up of this waste to toxic levels can occur in a relatively short period of time, which is often the cause of a fish's sudden death. It may be the amount of water surface area, not the water volume, that decides how many goldfish may live in a container, because this determines how much oxygen diffuses and dissolves from the air into the water; one square foot of water surface area for every inch of goldfish length (370 cm²/cm). If the water is being further aerated by way of water pump, filter, or fountain, more goldfish may be kept in the container. Goldfish may be coldwater fish, but this does not mean they can tolerate rapid changes in temperature. The sudden shift in temperature—for example at night in an office building where a goldfish might be kept in a small office tank—could kill them. Temperatures under about 10 °C (50 °F) are dangerous to goldfish. Conversely, temperatures over 25 °C (77 °F) can be extremely damaging for goldfish and is the main reason why tropical tanks are not desirable environments. The popular image of a goldfish in a small fishbowl is an enduring one. Unfortunately, the risk of stunting, deoxygenation, and ammonia/nitrite poisoning caused by such a small environment means that this is hardly a suitable home for fish, and some countries have banned the sale of bowls of that type under animal rights legislation. 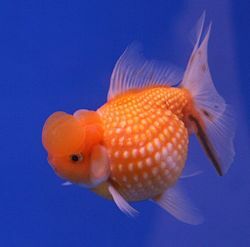 The supposed reputation of goldfish dying quickly is often due to poor care among uninformed buyers looking for a cheap pet. The true lifespan of a well-cared-for goldfish in captivity can extend beyond 10 years. Goldfish, like all fish that are kept as pets, do not like to be petted. In fact, touching a goldfish can be quite dangerous to its health, as it can cause the protective slime coat to be damaged or removed, which opens the fish’s skin up to infection from bacteria or parasites in the water. While it is true that goldfish can survive in a fairly wide temperature range, the optimal range for indoor fish is 68 to 75 °F (20 to 23 °C). Pet goldfish, as with many other fish, will usually eat more food than it needs if given, which can lead to fatal intestinal blockage. They are omnivorous and do best with a wide variety of fresh vegetables and fruit to supplement a flake or pellet diet staple. Sudden changes in water temperature can be fatal to any fish, including the goldfish. When transferring a store-bought goldfish to a pond or a tank, the temperature in the storage container should be equalized by leaving it in the destination container for at least 20 minutes before releasing the goldfish. In addition, some temperature changes might simply be too great for even the hardy goldfish to adjust to. For example, buying a goldfish in a store, where the water might be 70 °F (approximately 21 °C), and hoping to release it into your garden pond at 40 °F (4 °C) will probably result in the death of the goldfish, even if you use the slow immersion method just described. A goldfish will need a lot more time, perhaps days or weeks, to adjust to such a different temperature. Many sources claim that crucian carp (Carassius carassius) is the wild version of the goldfish. Research by Dr. Yoshiichi Matsui, a professor of fish culture at Kinki University in Japan, suggests that there are subtle differences that demonstrate that while the crucian carp is the ancestor of the goldfish, they have sufficiently diverged to be considered separate species (Pearce 2001). C. auratus has a more pointed snout while the snout of a crucian carp is well rounded. 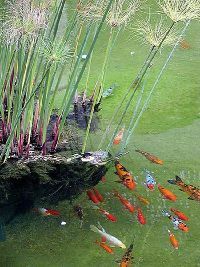 The wild form of the goldfish C. auratus gibelio or C. gibelio often has a gray/greenish color, while crucian carps are always golden bronze. Juvenile crucian carp (and tench) have a black spot on the base of the tail, which disappears with age. In C. auratus this tail spot is never present. C. auratus have fewer than 31 scales along the lateral line while crucian carp have 33 scales or more. The goldfish was first domesticated in China (BAS 2007). During the Tang Dynasty, it was popular to dam carp in ponds. It is believed that as the result of a dominant genetic mutation, one of these carp displayed gold (actually yellowish orange) rather than silver coloration. People began to breed the gold variety instead of the silver variety, and began to display them in small containers. The fish were not kept in the containers permanently, but would be kept in a larger body of water, such as a pond, and only for special occasions at which guests were expected would they be moved to the much smaller container (BAS 2007). In 1162, the empress of the Song Dynasty ordered the construction of a pond to collect the red and gold variety of those carp. By this time, people outside the royal family were forbidden to keep goldfish of the gold (yellow) variety, yellow being the royal color. This probably is the reason why there are more orange goldfish than yellow goldfish, even though the latter are genetically easier to breed (The Water Garden and Koi Company 2015). The occurrence of other colors was first recorded in 1276. The first occurrence of fancy tailed goldfish was recorded in the Ming dynasty. Around the sixteenth century or beginning of the seventeenth century, goldfish were introduced to Japan (BAS 2007), where the Ryukin and Tosakin varieties were developed. In 1611, goldfish were introduced to Portugal and from there to other parts of Europe (BAS 2007). Goldfish were first introduced to North America around in the mid to late 1800s and quickly became popular in the United States (Brunner 2003; BAS 2007). Selective breeding over centuries has produced several color variations, some of them far removed from the "golden" color of the originally domesticated fish. Goldfish may also lose their "golden" color, or rather any goldfish color, by being kept in a dark room. There are also different body shapes, fin, and eye configurations. Some extreme versions of the goldfish need to be kept in an aquarium—they are much less hardy than varieties closer to the "wild" original. However, some variations are hardier, such as the Shubunkin. A crucian carp carrying a mutation for yellow pigment. Some of the first goldfish may have looked like this. Comet Goldfish (Carassius auratus). One of the most common fancy varieties. In Chinese goldfish keeping, goldfish are classified into 4 main types, which are not commonly used in the west. Ce (may also be called "grass") - goldfish without anything fancy. This is the type that is usually used in Japanese carnivals, especially for "goldfish scoops." Jikin and wakin - goldfish with double tails, but with the body shapes of comets. Alameda County Mosquito Abatement District. 2011. Mosquito prevention for fish ponds. Alameda County Mosquito Abatement District. Retrieved April 25, 2017. Andrews, C. 2002. An Interpet Guide to Fancy Goldfish. Interpet Publishing. ISBN 1902389646. Bristol Aquarists' Society (BAS). 2007. Background information about goldfish. Bristol-aquarists.org. Retrieved March 30, 2017. Brunner, B. 2003. The Ocean at Home. New York: Princeton Architectural Press. ISBN 1568985029. Guinness World Records. 2003. Longest Guinness. WorldRecords.com. Retrieved April 25, 2017. Henderson, M. Goldfish pass memory test. The Times October 1, 2003. Retrieved March 30, 2017. Johnson, E. L., and R. E. Hess. 2006. Fancy Goldfish: A Complete Guide to Care and Collecting. New York: Weatherhill. ISBN 0834804484. Lloyd, J., and J. Mitchinson. 2006. The Book of General Ignorance. New York: Harmony Books. ISBN 978-0307394910. Owens, Michele. 2009. A Troubling of Goldfish. Retrieved March 30, 2017. Pearce, L. 2001. The "Common" Goldfish. Federation of British Aquatic Societies Retrieved April 25, 2017. Smartt, J. 2001. Goldfish Varieties and Genetics: A Handbook for Breeders Blackwell Science. ISBN 0852382650. The Water Garden and Koi Company, 2015. Goldfish Information. Retrieved March 30, 2017. Winter, T. J. 2005. Population size, growth, and control of exotic goldfish (Crassius atratus) in a small impoundment: Implications for managing future invasions. University of Minnesota Duluth. Retrieved March 30, 2017. This page was last modified on 26 April 2017, at 21:58.